Turns out, two out of three of our children happen to enjoy the "thrill" of lurching along the coaster track, hurtling skyward and then plummeting, twisting left, right and upside down in a dizzying sequence. 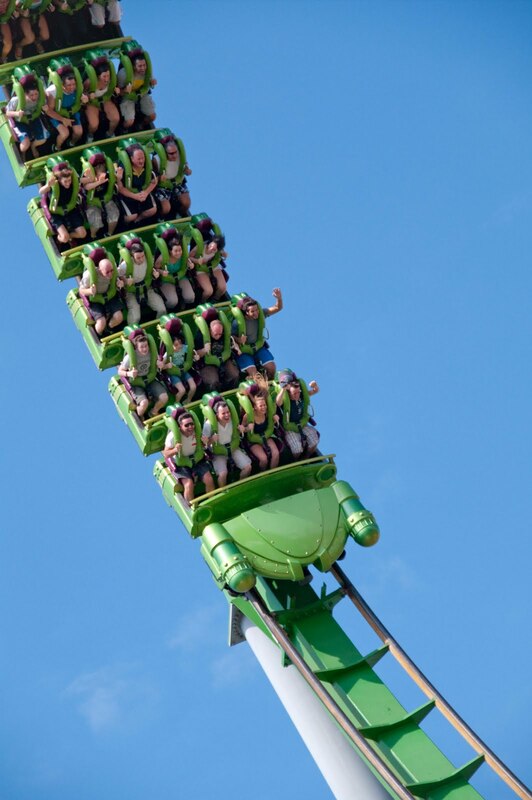 Can you find Prince Firstly and his littlest sister on the Incredible Hulk Coaster? Great photo! - 2nd row on the left? I tried to get this same shot every time Sam went around. I think he rode this thing six times in a row and I couldn't get it. You are a pro. Wow! What a great shot! Made me feel sick just looking at it. I'm not a roller coaster person either. Marie, you are right! They are in the second row, the first two on the left. She *just* makes the minimum height requirement! Matt, the secret is a really fast shutter speed... and a willingness to shoot every coaster that goes by, without trying to figure out if your kid is on it. :) It wasn't until hours later, when I finally had a chance to examine the pictures on a bigger screen, that I knew I had them! How did I guess which 2 kids you were talking about? How long was it until Mr. CM realized he past-tense liked roller coasters? I'm with you and #2 Chris. i used to stay away from them like the plague. turns out that I love them! I scream like a little girl at a Bieber sighting, but I love them!